These new Pixie Legs™ are unique to my line because the have feet! These light weight thigh high leggings are an ideal alternative to tights year round. If you hate the saggy middle on tights like I do, you will love these Posh Pixie Legs because there is no middle! The leg is a neutral fleshy melon color that is not quite pink and not quite peach. The color is so versitile that it blends well with pinks, peaches, whites and ivories. 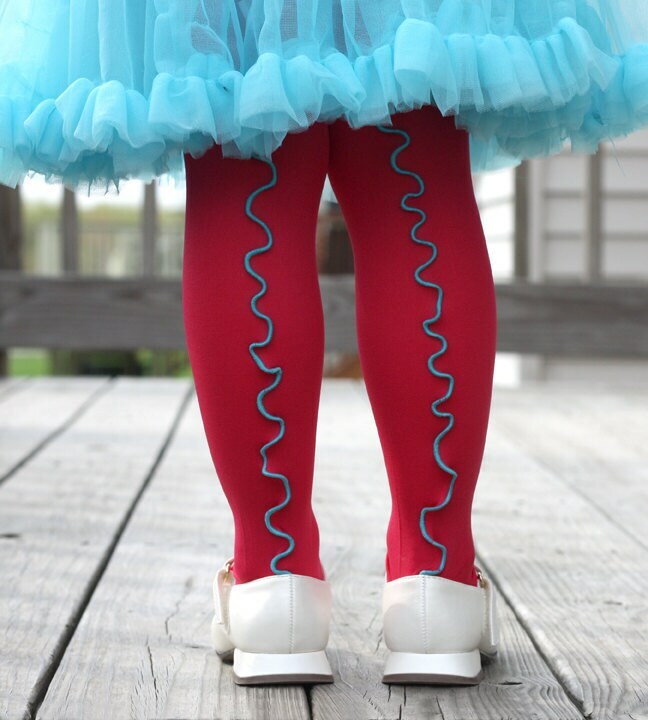 A beautiful feminine squiggle runs the length of the stocking down the back. the vibrant pink and lime squiggle is just screaming spring and summer! Looking for a different color combination for the squiggle? I can make these in just about any color under the sun. Just convo me with your request. I am happy to customize a pair for you! They all are approximately 18" long unstretched and will fit toddlers 3T-5T thigh high, or older girls-teens above the knee. *just because they are too stinkin cute! FREE FIRST CLASS USPS SHIPPING WITH THE PURCHASE OF ANY 2 OR MORE ITEMS IN MY SHOP FOR USA! Check out my many other listings. Like my Facebook page at www.facebook.com/poshpipsqueak for a sneak peek at new products and exclusive coupon codes. Adorable item, great, responsive customer service! Thanks again! Thank you so much for the fast shipment and beautiful product! !